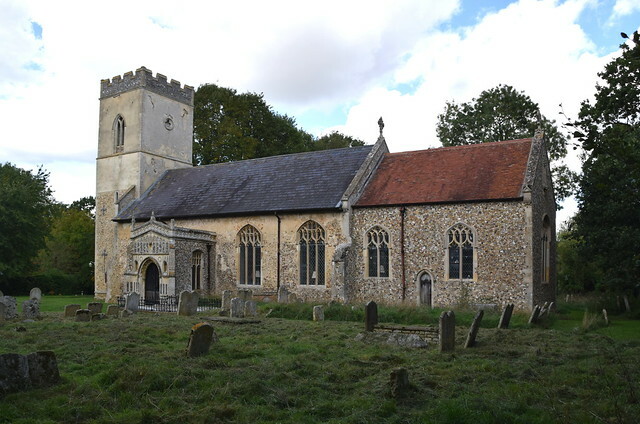 Finningham is a busy village on the back road between Stowmarket and Rickinghall, and the tower of St Bartholomew is a familiar sight to travellers on the main line between Norwich and Ipswich. 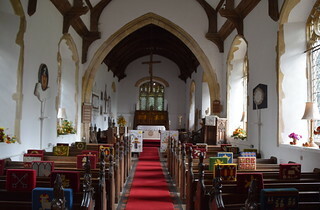 The church is pleasingly set away from the main road in a little maze of lanes. Everything is in proportion. 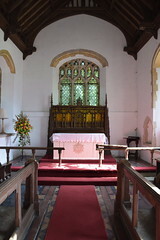 This is a small church, an intimate one. 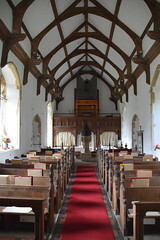 There are no aisles or clerestory. The elegant 19th Century glass sets the tone in the porch, and you step into a fairly dim space, the red carpet and dark woodwork creating a sense of seriousness. The hand of the Victorians fell heavily here, but there are still some intriguing medieval survivals, more than you might expect. The best of these is the range of figures reset in the top lights of the east window. They are fragmentary, partly composite, and obviously the survivals of what was a much larger sequence, which may have come from elsewhere in the church, or from another church altogether. Four of the six figures appear to be Apostles, with St James and St Simon obvious among them. A figure with a harp is probably an angel, and another figure is a composite of several angels, one hand holding a cymbal and the other a book. 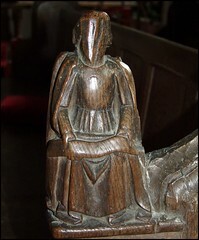 The other medieval survival of great significance at Finningham is a set of three bench ends. 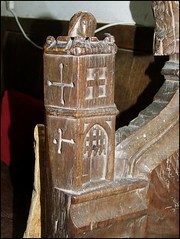 One of them shows a figure in a tower, their head peeping out of the top. This may be part of a set of the Seven Works of Mercy, illustrating Christ's injunction to visit the prisoner. 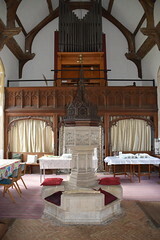 Several similar bench ends can be found in other East Anglian churches. Nearby, another fragmentary bench end may also depict a tower, but I couldn't help wondering if it was actually intended to be a pulpit. A third shows a seated angel holding a scroll. 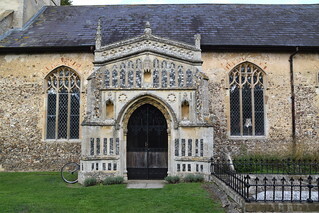 This may be intended to represent the Evangelist St Matthew, but there are several larger East Anglian churches where seated angels with scrolls accompany illustrations from the Seven Deadly Sins, the Seven Sacraments and the Seven Works of Mercy on adjacent benches. 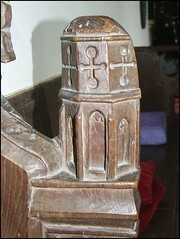 If this is the case, it may well be that the bench ends came from another, larger church originally. 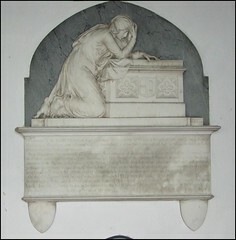 There is an intriguing memorial window to the 19 year old James Hatley Frere, who died in 1870. 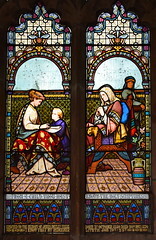 It shows, or appears to show, the young James with his mother and grandmother in a depiction of Eunice sharing scripture with the young Timothy while Lois looks on, each member of the Frere family playing their appropriate part. Unusual, but who was the artist? No one seems to know, but it struck me as similar to some of the minor work of that time by the great Henry Holiday. 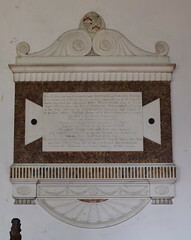 There are other memorials, mostly to the Frere family but including one to Sir John Fenn, who had married into the Frere family and was the 18th Century antiquarian who rediscovered the Paston letters. His wife, Sam Mortlock enjoys telling us, was the authoress of earnest books for children written under pseudonyms including Mrs Teachwell and Mrs Lovechild, and as such became the model for Lady Bountiful in George Borrow's equally earnest novel Lavengro. 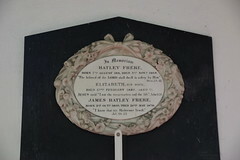 This contradiction of a strictly Biblical view of human development was considered so radical that the Society suppressed it, and Frere's work did not come to light until the 1860s, by which time the likes of Anning, Wallace and Darwin had confirmed Frere's suspicions about the longevity of the human race and the likely origins of human species. 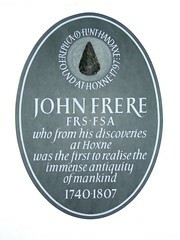 As the Minnesota State University website quaintly puts it, Frere was the discoverer of England's Antiquity of Humans.